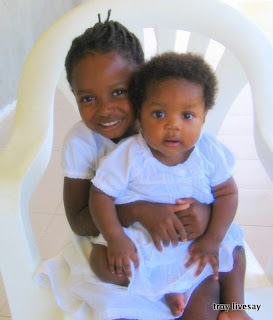 Hope and Phoebe (and Gracie that we recently met) have two older sisters still here in Haiti that were raised by Beanne. Their names are Joanne and Bedline. Joanne has given birth to two children and they were both placed in an orphanage for adoption due to the family’s struggles financially. She is currently on bed rest after miscarrying twins. Bedline has given birth to three children. The last time I visited their home only the youngest baby was present. I asked Beanne where the other two children were – afraid I already knew the answer. Beanne's grand-son and grand-daughter have now also been placed in an orphanage. Bedline had mentioned this possibility in the past and I did my best to discourage her – we talked about the issues of bonding and attachment as her children are old enough to experience the deep pain of abandonment. She seemed to understand and I thought she had decided to keep them with her since they had been around for my last few visits. After her third baby was born, though, the three women decided they could only provide for one extra mouth to feed. The two older children were left at the orphanage. Hope and Phoebe have nieces and nephews that are now a second generation of children being relinquished to an orphanage. My heart grieves for those children and wonders about what they are going through even now. I know at least one of them has a family in the US working on adopting him – and for that I am glad – but I struggle with questions about what is best for these children. It is an odd thing to wonder about considering that we have been blessed to be a part of adoptions in many ways. I consider myself very pro-adoption, but in this case, seeing firsthand the experience of this family I find myself wondering and wishing there were other ways to keep families together. I know it would be better for these two children. At least I think I know. Actually, I am not sure at all. When I learned that these two had also been placed – I looked at it from every possible angle and had a lengthy discussion with Beanne trying to determine ways to make it work for them to keep those kids at home. We’ve been actively trying to help them to break this cycle of unplanned pregnancies and abandoned children for years. Apparently we haven’t made any progress.